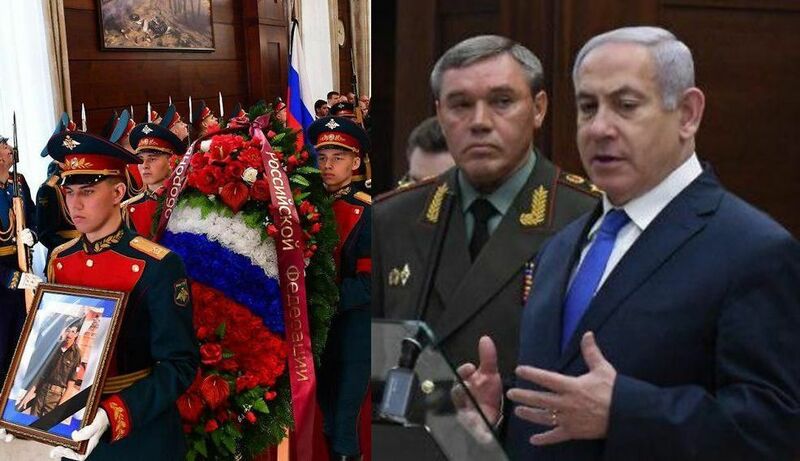 A special memorial ceremony for the missing Israeli soldier Zachary Baumel took place at the Russian Defense Ministry on Thursday, April 4, led by Russian Chief of Staff Gen. Valery Gerasimov in the presence of visiting Prime Minister Binyamin Netanyahu. This was the first known instance of the Russian High Command conducting a military ceremony with full trappings in honor of a foreign serviceman. Baumel had been missing for 37 years since the First Lebanon War until his remains were recovered and returned to Israel by the Russian army on Wednesday. DEBKAfile’s military sources note that the exceptional honor awarded by the Russian high command to Israel and its defense forces marks the strengthening of ties between Moscow and Jerusalem and their armed forces. It also ends their disagreement over the downing of the Russian IL20 spy plane over Syria last September. A guard of honor and Gen. Gerasimov in person greeted Netanyahu, who doubles as defense minister, and his companions at the gate of the defense ministry, when they arrived from talks with President Vladimir Putin at the Kremlin. At the start of their conversation, Putin stressed that Zachary Baumel’s remains were found by Russian troops “with Syrian assistance” at the Yarmouk camp near Damascus, once occupied by Palestinian refugees. He promised that Russia would keep on searching for the two Israeli soldiers who went missing with Baumel, the late Yehuda Katz and Zvi Feldman. Zachary Baumel is to be laid to rest in Israel on Thursday night. Israel takes “leave no soldier behind and never forget” to a whole different standard. Israel is simply practicing the Culture of Sons and Daughters of Abraham, Issac and Jacob have always Honored every Persons Right To Life and Family holding such Life even after Death remaining Dear to them, especially in his dedicated service in defending Israel. The Culture is one enjoying Life and Living and respecting Death, but in ways reserved for that Family, Friends and Israel to mourn and the Russians know it, and Honored such practices known to being a big part of the Jewish Culture. תודה Todah Thank You! Something fishy…don’t necessarily trust it. It stinks of deceit. It is a very intricate camouflage to hide the true Russian-Iranian plan to destroy Israel. But Bibi is also a Christian Bible reader. He is proving to be an excellent wild horse rider and a grandmaster at chess. He knows the story if the Trojan Horse. Netanyahu needs to read Ezekiel 38 which demonstrates that ROSH will invade the mountains of Israel to destroy. The L-rd G-d, HaShem, Himself, is going to burn the cancer out. For the bed is too short for one to stretch, and the ruler-it shall be narrow when he enters. For like the mountain of breaches shall the Lord arise, like the valley in Gibeon He shall be incensed; to perform His deed, strange is His deed, and to perform His work, strange is His work. And now, do not scorn, lest your pains become strong, for a complete destruction have I heard from the Lord God of Hosts upon the entire land. Interesting that Russia was silent when Israel bombed Iranian installations near Aleppo last month. The Russia – Israel relationship is very complex. On the one hand they have pretty mush let Israel take a lot of military action in Syria and Lebanon these last few years, and when Israel`s forests were being consumed by wild fire several years ago the Russians sent huge firefighting airplanes that helped extinguish the inferno. Yet Russia sells weapons systems to Israel`s enemies. Are the anti missile systems that Russia has been selling to Syria really operational or Russia`s best? Are the Russians really intent on helping destroy Israel when the time is right? Or is it in Russia`s interest that Israel remain strong to counter Iran? Many say that Russia is Gog in the Ezekiel War, yet I have read other interpretations that say it is Turkey and Muslims in the southern Caucas mountains, and that Russia is not involved. Could Russia have its eyes on the Israeli Natural Gas findings? See, see, now you see??? ….. ” near Damascus, once occupied by Palestinian refugees “. There, that is their place! It looks bit strange. The coffin, with Israeli flag, and two rows of Russian soldiers around. Can be symbolic event. Netanyahu must be a Russian. That’s a good reminder from Vlad. We have been getting killed in Lebanon for a long, long time. I’m sure glad we ran away in 2000. In the fluid world of international politics, this suggests that, at least today, Russia and Israel have common interests. One factor to consider is that U.S. influence and support may be waning, and Israel needs major power friends. It may be that Israel – a high-tech, nuclear-armed country with a large Russian-speaking population – finds Russia a better ally than the U.S., which helps Russian ambitions in the region. It is not going to happen because the U.S. gives Israel billions of dollars in free weapons which is something that Russia cannot afford to give away for free. If Iran was not paying Russia billions from the released Obama nuclear agreement and Turkey was not buying the S-400 from Russia for billions, its operations in Syria would be compromised. Syria has already cost Russia influence over Ukraine in that Russia has lost Ukraine which is more important than Syria. Now that Iran’s billions will be somehow running out for payment, Russia is trying to cultivate greener pastures like Israel. Also, Putin sees the large crude oil deposit discovered in the Israeli Golan as the natural resource that will eventually pay for Syria’s reconstruction. Thus, when he thinks of all foreign troops leaving Syria, it also includes Israel from the Golan Heights. It amazes me how politicians cannot put together the pieces of this Syria puzzle. Russia was first to recognize Israel and first to say Jerusalem was ISRAEL capital. Its protest against Golan Declaration by Trojan Horse was very weak. For near a decade, Russian billion dinar ballistic JUNK has not defended Syria ONCE. Long ago, they made a deal to always keep the Arabs behind Israel tech-wise and militarily. Their friendship w/ Arab World is a RUSE. Bolshevik jews still rule Russia (updated to ‘Chabad’ faction nowadays). NATO USrael would have wiped Syria in an express maneuver. All Russia did was slow that attrition down. End Game? Syria is finished. Over. It Russian Chabadist Pootin has been serious about preserving Syria? He’d have knocked down the first IAF overflight and nipped the last 8 yrs proxy jihadi invasion in the bud. Perfect timing (or dumb luck), Bibi ?! Never trust the enemy of Israel, that provided the arab armies with very strong weapons. Don’t forget 1967, 1973 wars. Don’t forget iranian nuclear program. Who says Israel trusts them? But it’s certainly an improvement from the days with the KGB invented the PLO to counter U.S. interests in the Middle East, yes? May be the Russians military understand the value of the one who fought the good battle and did not survive at the end. Is that so hard to understand or so hard to believe? Smart move, my man, PuTiN, messiah of Russia. Now let them kill Russian personnel and we will see how this plays out politically for Mr Nu’k’m’yahu. Checkmate. Putin, for all his faults, has more heart and respect for the Jewish people than all the wacky leftists, including Bernie Sanders, running for the U.S. Democratic presidential nomination. Putin knows how to play emotional and manipulative games since he was the top KGB leader and spy. In the war in Syria, he has not only used overwhelming brutal power against the Syrian rebels but he has also used friendly disarming diplomacy and manipulative reconciliation false promises. This action is somewhat confusing but it plays on Bibi’s ‘s heartstrings. Remember that Bibi lost his soldier older brother in a military operation. Let us not forget that this soldier was killed by Syrian soldiers in Lebanon. Russia has always supported Syria against Israel. Putin is showing Bibi that he has the power to return all missing Israeli soldiers in Lebanon and Syria if Bibi does him favors as well. This is a very interesting charm offensive. The truth is that Russia is currently desperate after losing Ukraine and with Iranian funds drying up in Syria. Magnanimity is often a man’s option when it doesn’t interfere with strategic objectives. Putin has been feeding Islamic snakes like his predecessors. But he knows that Islam will devour Russia too when the time is ripe. Islam is best on his leash right now. Israel is the easiest adversary to placate with the easy gesture of restoring Zachary Baumel’s remains. Hey in the real world you mingle with friends and foes, but Israel is the gur arie – lion cub – in Genesis and can afford to walk around proudly and courageously knowing God is protecting her. Projecting genuine liking for good deeds from all is not a big deal for a leader. Simply bizzard. I desperate attempt by Netanyahu to curry favor with dim witted voters. Yes it is an intervention into Israeli elections and a payback by Putin to Bibi for not deploying anti_Russian sanctions while most western countries did when Putin overran the Crimea. The holy bones of saint apostle Peter were found in a shrine to the friends of Jesus Christ the one only god father and spirit of three in one. The last possessions were also found to include a burlap sack. We are one day closer to rapture. Praise peace!